We all have those family favorite recipes from when we were growing up – things your mom made time and again. This is one of those recipes. I remember my mom making it often when we were younger. She would also make and take to friends in a time of need because being a good Southerner, you have to have a “go to” casserole recipe in your repertoire to share with others. 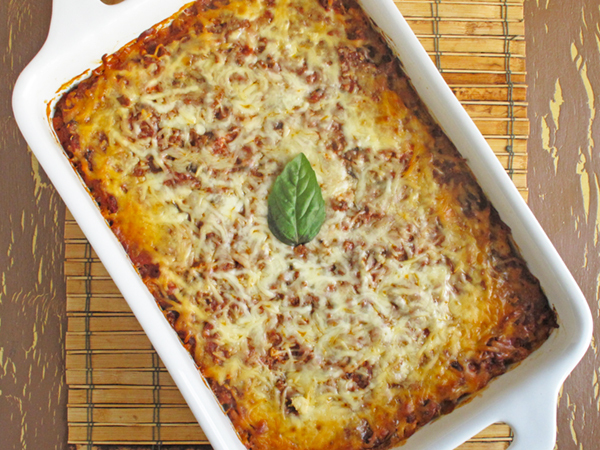 This recipe is a nice spin on lasagna (another childhood staple) and perfect for those who love spaghetti yet with a twist. Spring onions, or scallions or green onions – whatever you want to call them – add a nice punch of flavor to the overall dish, not to mention a delicious aroma while it is baking. Replaced some of the beef in the recipe with mushrooms. Mushrooms have a meaty quality to them and can really add flavor and texture to dishes that call for ground beef. Mushrooms are one of the few foods that naturally contains vitamin D and are a rich source of other vitamins and minerals like many B vitamins, potassium and selenium. Used tofu instead of cream cheese to help lower fat content as well as give a boost of soy protein, calcium and iron. This is a great way to introduce tofu to your family and they will be none the wiser! I’ve done the same with lasagna with great results too. 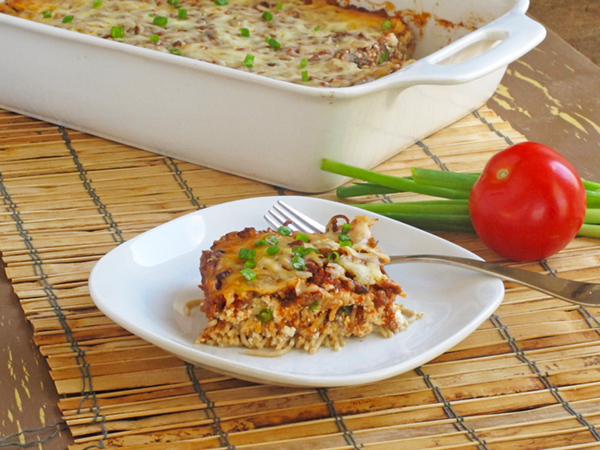 Used light sour cream in place of full fat sour cream to lower overall fat content of the dish. This recipe is also perfect to assemble ahead of time and then keep in the refrigerator to cook and serve. 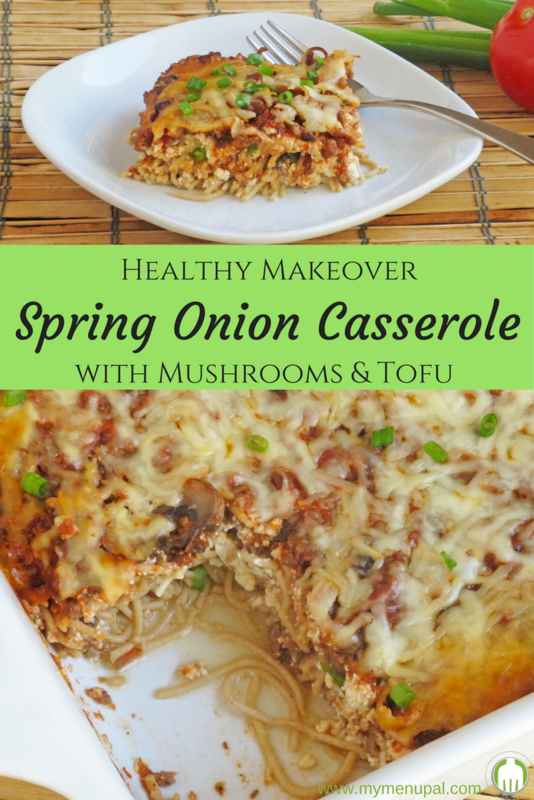 A makeover of one of my favorite childhood casserole recipes to incorporate mushrooms and tofu while lowering the fat and boosting the overall nutrition. In a large pot, cook the noodles in boiling water until they are al dente, or still a little firm but easy to bite. While the noodles are cooking, brown the ground beef in a large skillet. Once the beef is browned and no longer pink, add the mushrooms and garlic and cook for an additional 5 minutes, or until the mushrooms are soft. Add salt, pepper, sugar, soy sauce, and tomato sauce to the meat mixture. Bring to a boil then simmer covered for 15 minutes. Combine tofu, sour cream, and green onions in a bowl and stir well, breaking tofu into small pieces. 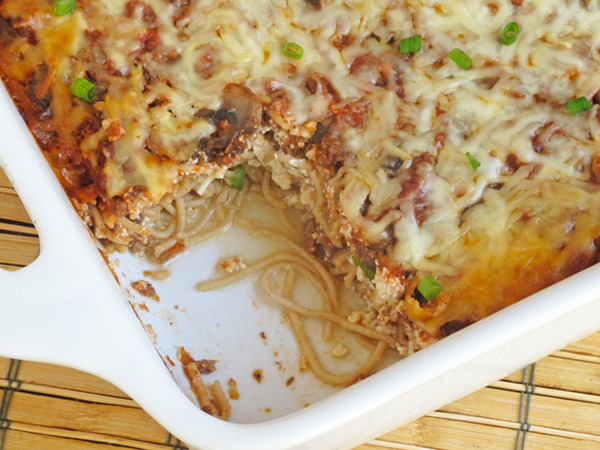 In the baking dish, begin layering by spreading half of the noodles in the bottom of the dish. Top with half of the tofu mixture, then half of the meat mixture. Repeat layers. Top with mozzarella cheese. Cover with aluminum foil and bake for 30-45 minutes or until heated through and cheese is melted. 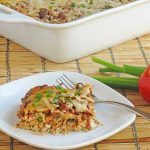 Make Ahead: Assemble the casserole ahead of time and then store covered in the refrigerator until ready to bake and serve. This is also a great meal to prepare and take to a friend with baking instructions. And just fyi, in case you are like Lesley, and confuse tomato sauce with ketchup, well that could work too though the end dish may be a tad on the sweeter side!! No joke, she did this one time and called me in a panic about how to save the recipe. We came up with a few more additions to up the savory flavors so the dish wasn’t ruined. Yes, even we flub recipes from time to time!